The Royal Agricultural Society of South Australia holds this event every year. The show covers many competitions and events ranging from Arts and Crafts to animals, the animals are from farm to domestic, and inbetween there are events for flowers, fruit and vegetables, cooking, etc., etc. Pertinent to the judging of dogs, this again is in different categories and classes. 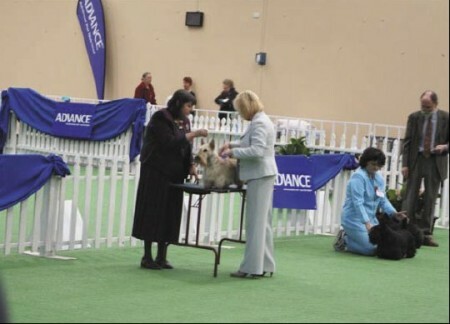 This article in particular is about the judging of confirmation, but there is also Obedience, Agility and Jumping, Dog Grooming and Photographic. 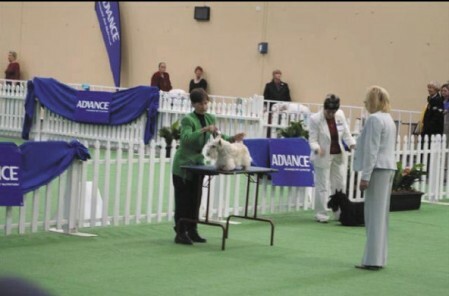 These groups are split up into manageable sizes where certain breeds in various groups are shown over the nine show days, with the last day being where the finals for Puppy, Best in Group and Best in Show are judged. This year, we have had the pleasure of two judges from Ireland, Mr. Sean Delmar and Mrs. Cathy Delmar as part of the judging team. 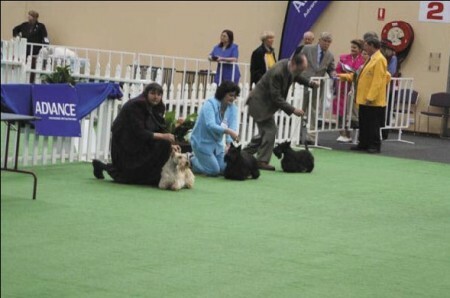 The judging of the Scottish Terriers was very late on the first day of the Royal Show, and as exhibitors by then after a day of talking and answering questions on Scottish Terriers, plus the many snacks, etc., we wearily made our procession to the judging ring to do battle. of their cages and trolleys, woe betide any careless handling here! Mrs. Cathy Delmar was the judge for the Scotties, of which she did a very thorough job from a fine line up. 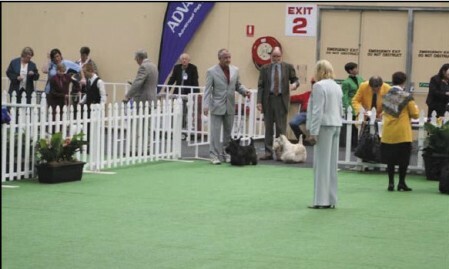 Not only were dogs entered from South Australia, but there were also many exhibitors from Victoria and New South Wales. 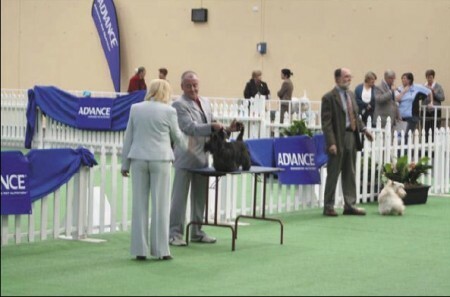 It was great to have a terrier person to go under, and the fact was shown by the amount of Scottish Terriers that were entered. The judging went smoothly and everyone had a good time, it was also great to be able to catch up with fellow enthusiasts from far and wide at the show, particularly as Australia is so vast.